It's the end of the year, a time when no significant news is reported by local media outlets. 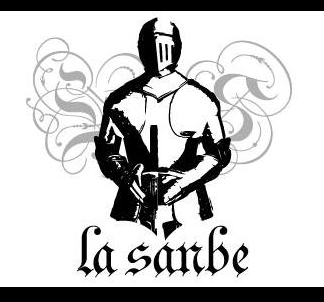 For that reason I bring you La Sanbe's 'Person of the Year.' My selection for 2018 is Jaime Canales. 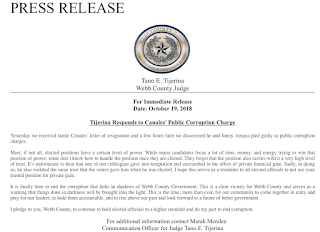 The former Webb County Commissioner, and sometimes school administrator, pleaded guilty in federal court two months ago. Canales was found to be taking illegal gifts from an engineering company lobbyist, a man who may be the person who took his own life in late October. The go-between these two gentlemen was a weasel named Johnny Amaya, a boil of a man who knew his way around our political circles. 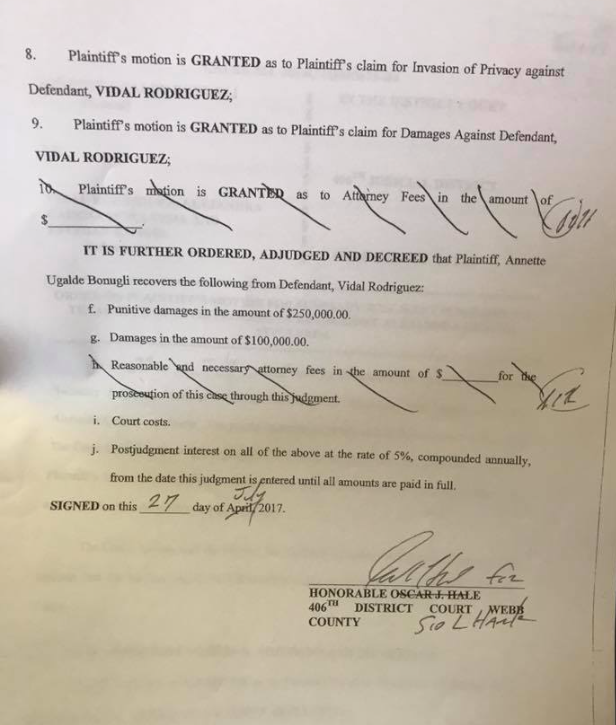 An unsealed indictment showed how Jaime Canales was none too shy about asking a corporate shill for money and use of a condominium at a nearby vacation hot spot. 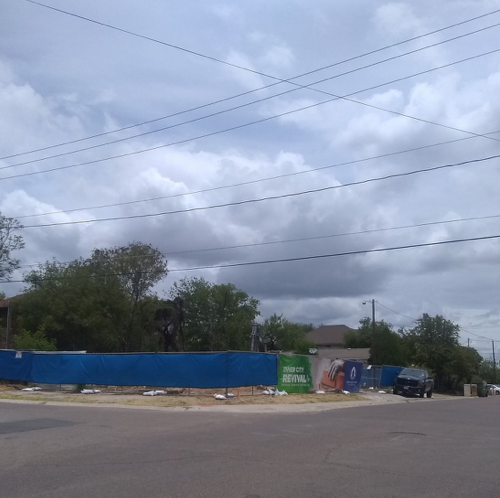 That in exchange for introducing a lucrative road project in to the commissioners court agenda and the subsequent approval thereof. It's the classic story of lobbyists writing policy for elected officials, compensating those same officials for carrying out their wants, and then securing multi-million dollar contracts to enrich themselves immensely. 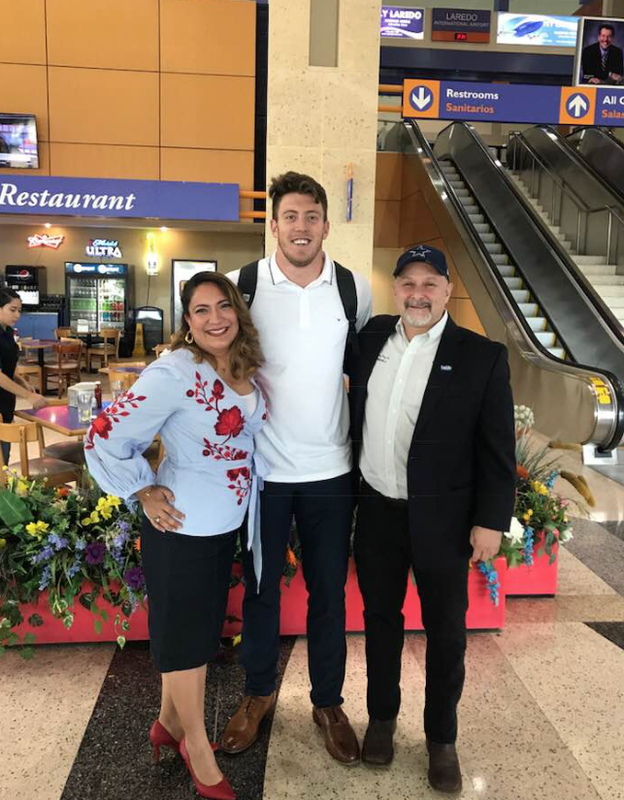 Canales played along with the whole scheme, scoring money and trips along with way. It's unfortunate that this man got lured in to the world of local politics. You would think that somebody who had a cushy job, that of administrator, would be happy with what he had; but perhaps the boredom was too much to shoulder. He took hold of something more, a position that brought a little more prestige and attention. As commissioner he got a comfortable new chair, and a new title that bestowed upon others the obligation to refer to him as the honorable Jaime Canales. He gained a new workload that brought with it a handsome yearly salary. He secured the admiration of people like me. 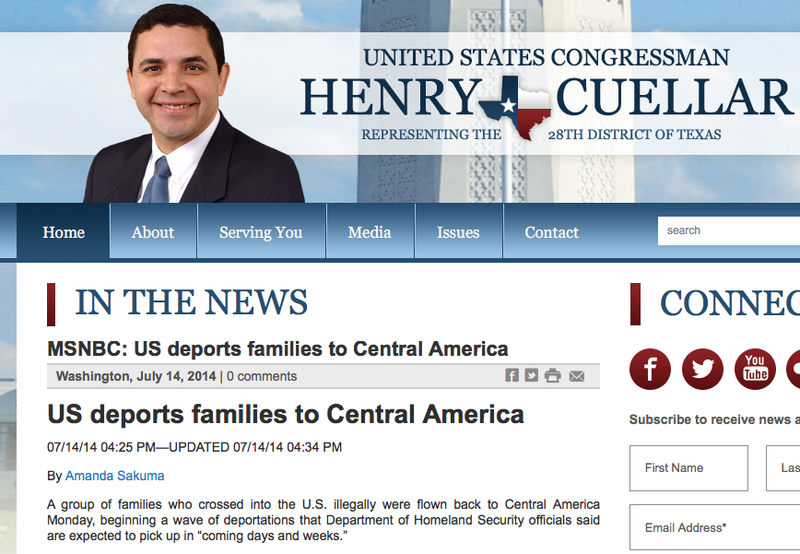 I met Canales before he was elected to office, and then several times by chance during his tenure with the county. He seemed personable, capable and dedicated to his work. 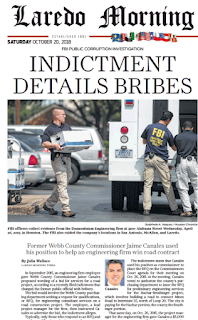 Unfortunately he became another corrupt cog in the cynical world of Webb County politics. For his greed, Canales will be sent up for a prison term of about five years. We'll find out exactly how much time he'll serve when he's sentenced in February. For now he'll be our Person of the Year. Soon he'll become inmate number Pendejete who should've known better! Take care, people. Hope seems to be in short supply around here. A friend mentioned to me the time that Charles Manson was jailed in our fair town. I found out that he was extradited from our sister city on June 1, 1960. Manson apparently violated the Mann Act, which makes it a crime to transported women across state lines for immoral purposes. Interesting tidbit of information if I do say so myself. 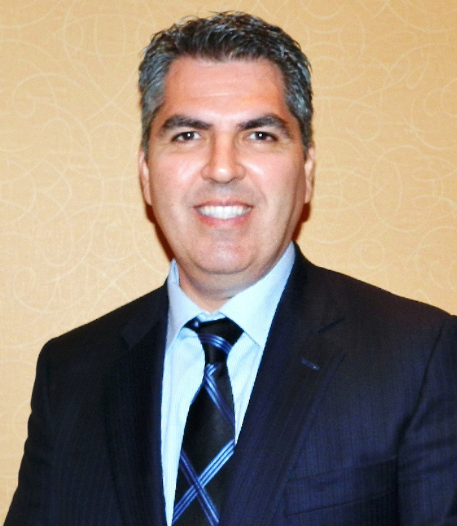 Mayor Pete Saenz was sworn in this afternoon for his 2nd term. 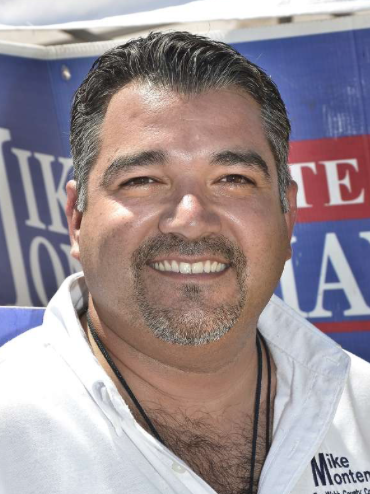 He beat Roque Vela Jr. in a runoff race on Thursday of last week. As with any election, voter turnout was dismal. That, however, didn't stop the Times from describing Saenz's win as a landslide. The mayor received 13,972 votes, out of approximately 131,000 registered voters in Webb County. 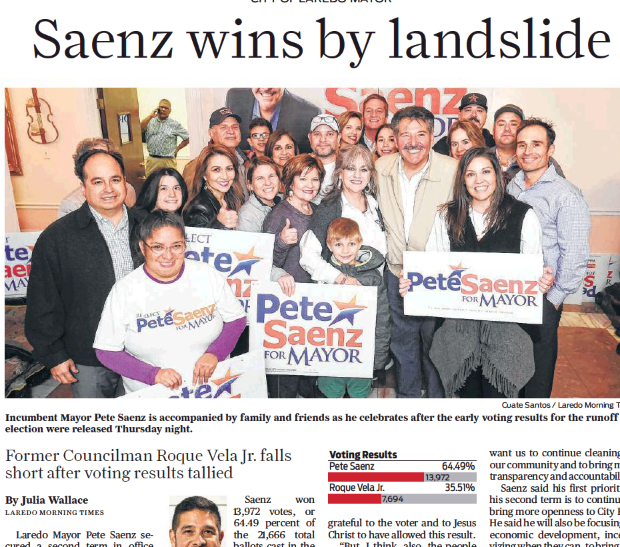 Saenz won with about 10 percent of the electorate. He was "grateful to the voter and to Jesus Christ to have allowed this result." 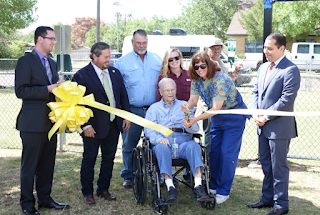 (Julia Wallace - LMT) The mayor went on to say, the people spoke with their vote, and this is what the community wanted. End quote. You have to hand it to the mayor for putting a positive spin on the end result. 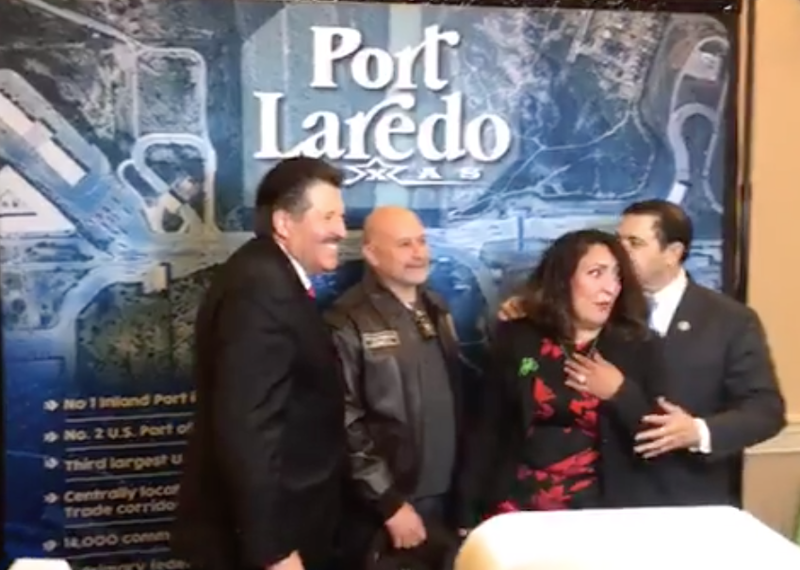 He's the face of Laredo; Obviously he has to be as diplomatic as possible. I'm happy for the mayor, but him invoking Jesus Christ and the Times using language like landslide is a bit much. You can't make it out to be epic when it's actually unremarkable. You're the mayor of Laredo, that's great, but you beat the guy with anger issues who ran on the promise of bringing back the garbage pick-up schedule of yesteryear. Go ahead and pat yourself on the back but don't take yourself too seriously. 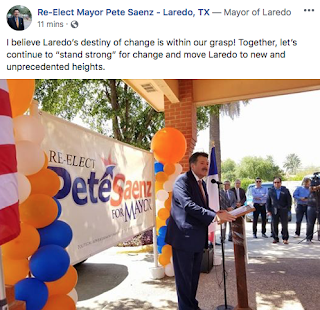 You're the mayor of Laredo, after all. Labels: mayor, Pete Saenz, Roque Vela Jr. 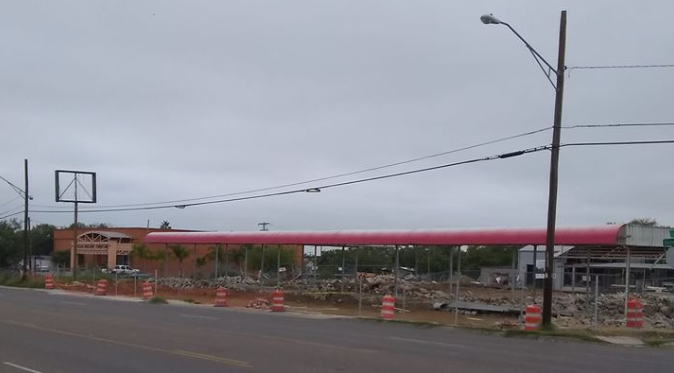 The car wash on Saunders, across from Burger King, is almost gone. Progress in motion. The photo above is courtesy of Google Maps. Demolition has been going on for about two weeks. Fliers arrived at the Keyrose household by the several this election season. 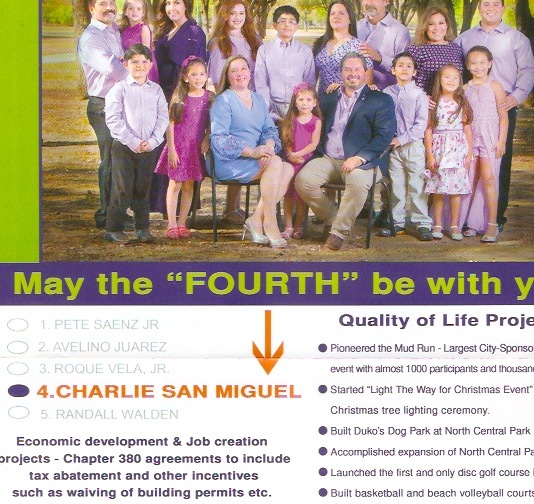 One that gets the nod for stupidest cheesiest is Charlie San Miguel's mailer that included the caption: May the "Fourth" be with you. 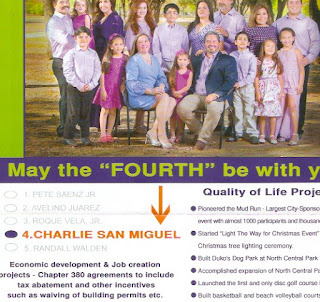 The stocky candidate for mayor used a play on words, a reference to the movie "Star Wars." He did so because his name was "FOURTH" on the ballot. As a council candidate, the move could've been cute. But as mayoral prospect it comes across as stupid. Naturally he lost his bid. 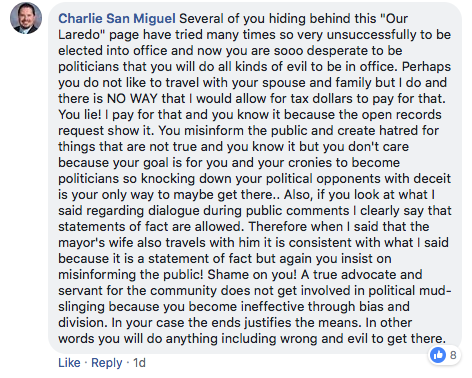 We'll soon forget about Charlie San Miguel, as he terms out from city council. We'll save his flier for posterity (and for an occasional eye roll). 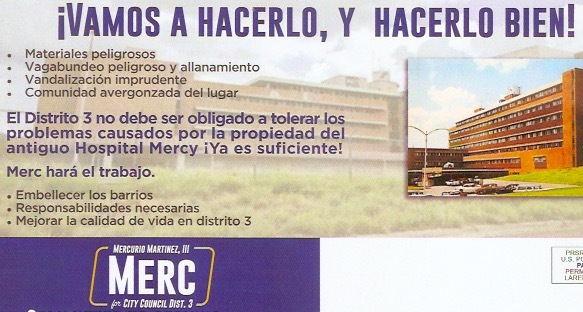 Another flier that was dropped at our doorstep is that of Mercurio Martinez. 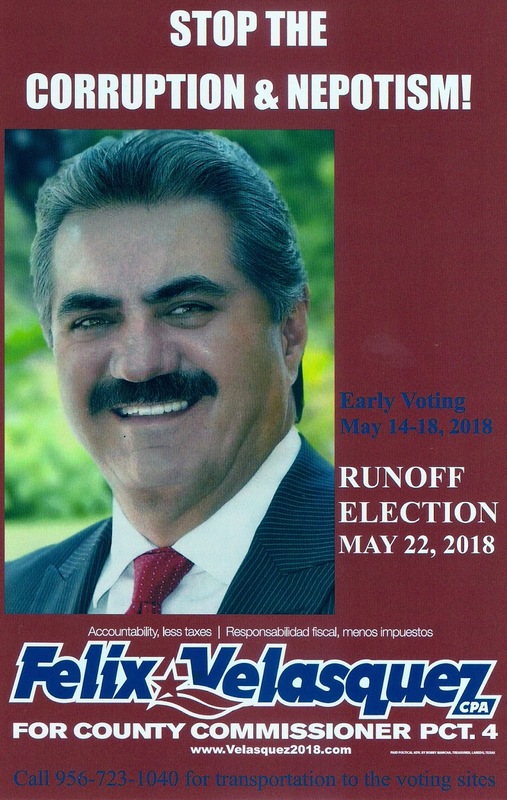 He is heading into a runoff in December for City Council Dist. 3. 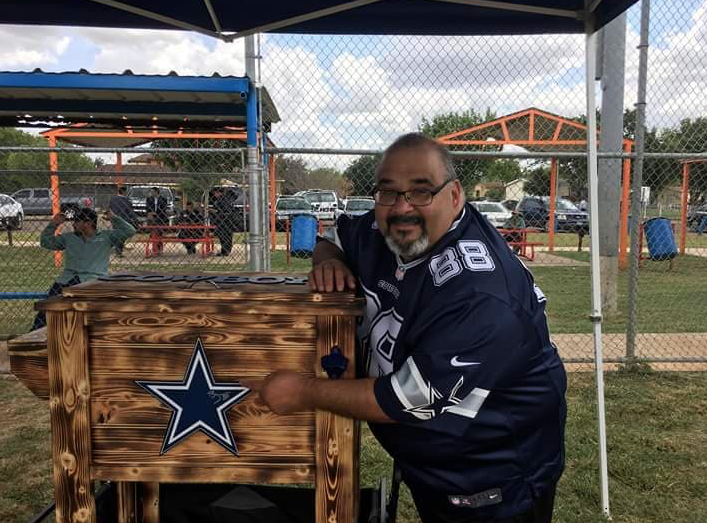 Councilman Alex Perez busied himself with smaller, more trivial projects during his 8-year term. He leaves behind the eyesore that can be viewed from almost any part of the city. The old hospital was vacated in the fall of 1999. It's not fair to pin this solely on Alex Perez - the glaring example of inaction - but he SHOULD take credit for his many shortfalls and not just his supposed accomplishments. 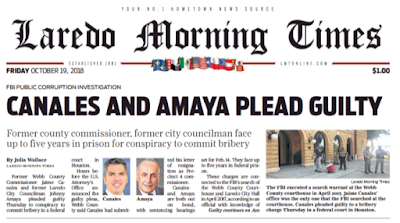 Hours after Tijerina's press release, we learned that Jaime Canales and Johnny Amaya had pled guilty to bribery charges in a Houston court. The speculation was put to rest. 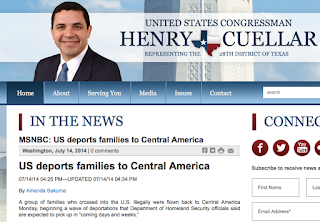 Canales' sudden resignation had a reason. The FBI raided city hall and Mr. Canales' office in April of last year. Current and former government officials were named as target subjects. 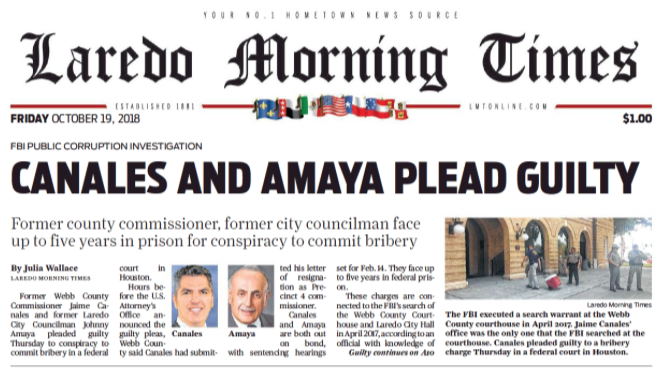 Commissioner Canales turned out to be the first casualty of the feds' investigation. 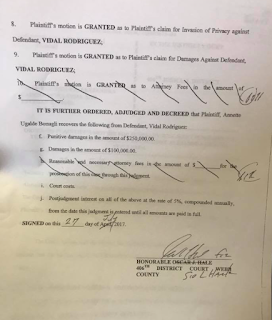 The County Judge put out another statement on Friday. 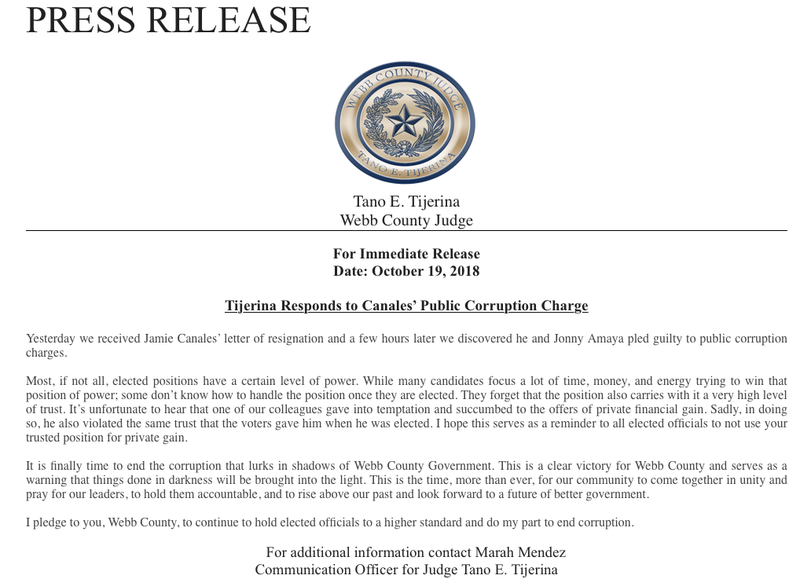 Save for the horrible grammar in the second presser, Judge Tijerina took issue with Canales' corrupt leanings. 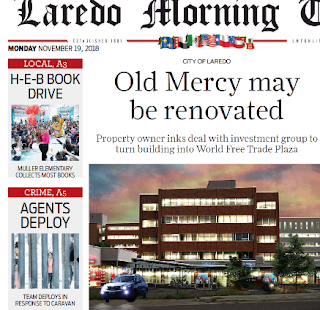 The Saturday edition of the Laredo Times gave us more details on the scheme that was hatched by Canales, Amaya and an unnamed corporation. We have yet to hear of any more indictments, arrests or plea deals. The FBI's case from a year ago involved more than one county knucklehead. For now we wait. Downtown is changing as far as nightlife. So this conference center will support all of that. 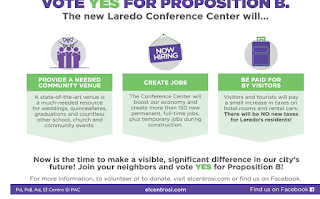 Ask everyone to support this proposition, El Centro Si, because it's going to give us a better downtown, it's going to give us a better community, and this is something our citizens and residents need. Every time somebody (Balli) has brought up the construction of a convention center, I've imagined that a large space, with meeting rooms, was needed for actual conventions. I thought Laredo needed a facility to host events that couldn't be had at the arena; again, actual conventions that would bring in visitors. But the group pushing for the convention/conference center - Balli, La Posada, Fasken Oil & Ranch, Ltd, Chamber of Commerce, IBC Bank, etc. 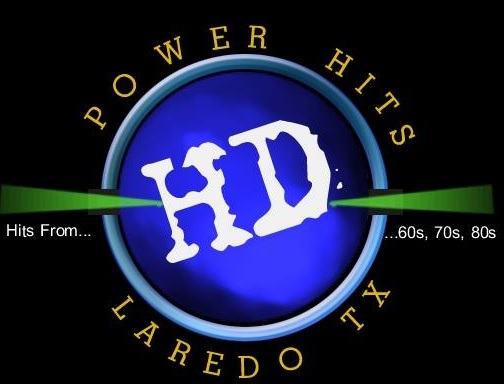 - is now trying to convince the Laredo public that it'll be a venue to serve us. 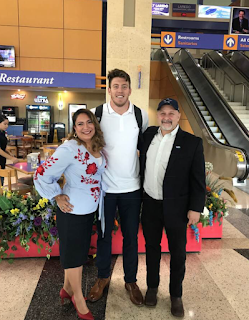 The CONFERENCE center will be a great site to host weddings, quinces, graduations and so on, so says the new Centro Si advertisement. Venues for those kinds of events already exist. To host quinceaneras shouldn't be a selling point for building a convention center. The arena, baseball field and golf course have been under-utilized, hardly used for their intended purposes. 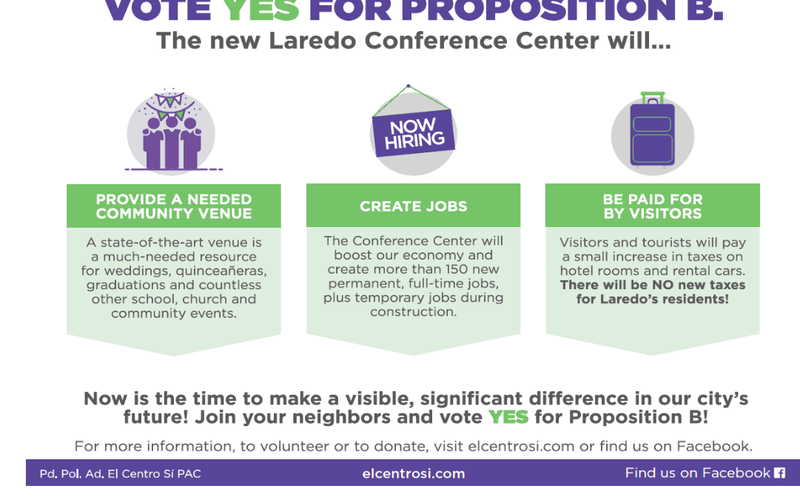 Now our leaders are trying to sell us on the idea of a convention center; but they're telling us that the facility's calendar year will be made up of small events, supported by actual Laredoans. Already they're revealing in their latest pitch that big conventions will be few and far between. 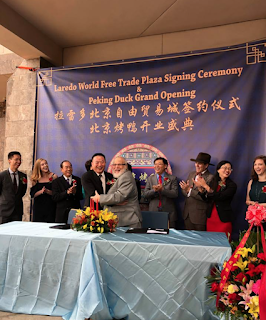 The convention center may be useful for the people of Laredo in terms of low-paying jobs, but it shouldn't be a site to host receptions that will benefit La Posada and other City of Laredo insiders. Local activist Remy Salinas appeared on Beyond The Headlines (KGNS) last weekend to speak against the construction of the convention center. He spoke in detail about the fact that convention centers in south Texas under-perform. 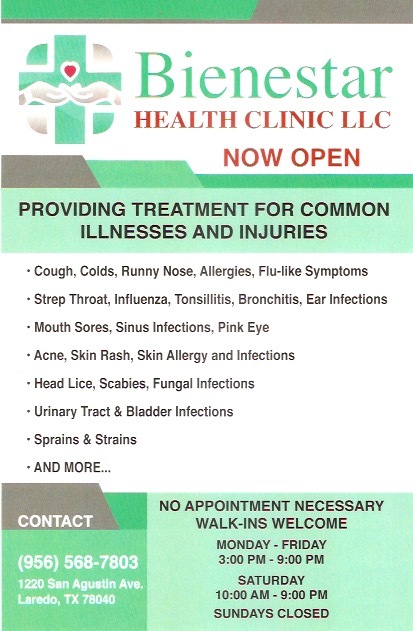 Check out part of the show below. And come November 6, vote NO on the convention center. UPDATE: 11/23/18 Something that Richard Raymond promised once. 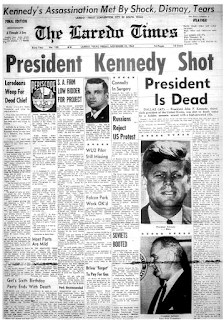 A madman went on a killing spree that lasted over a week. 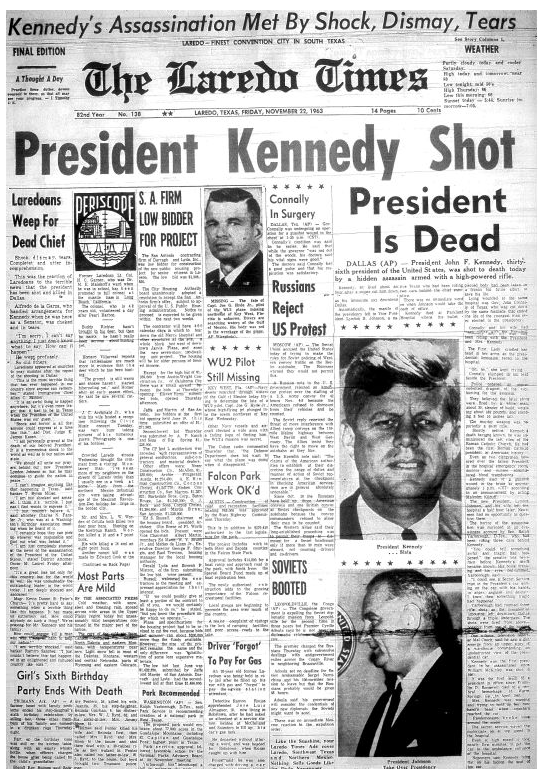 By Saturday afternoon, we learned that four people had been executed by a pyscho living among us. 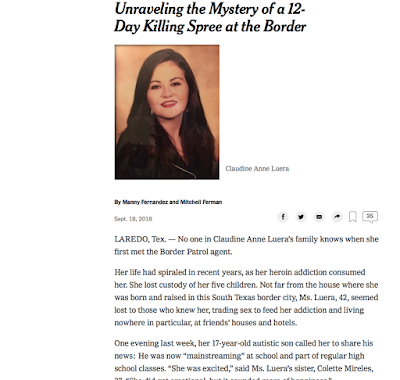 One of the victims was the sister of a good friend. 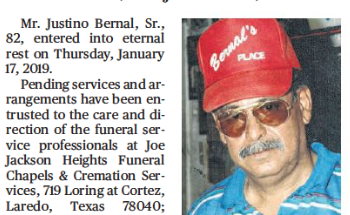 I can't imagine what the family is going through. 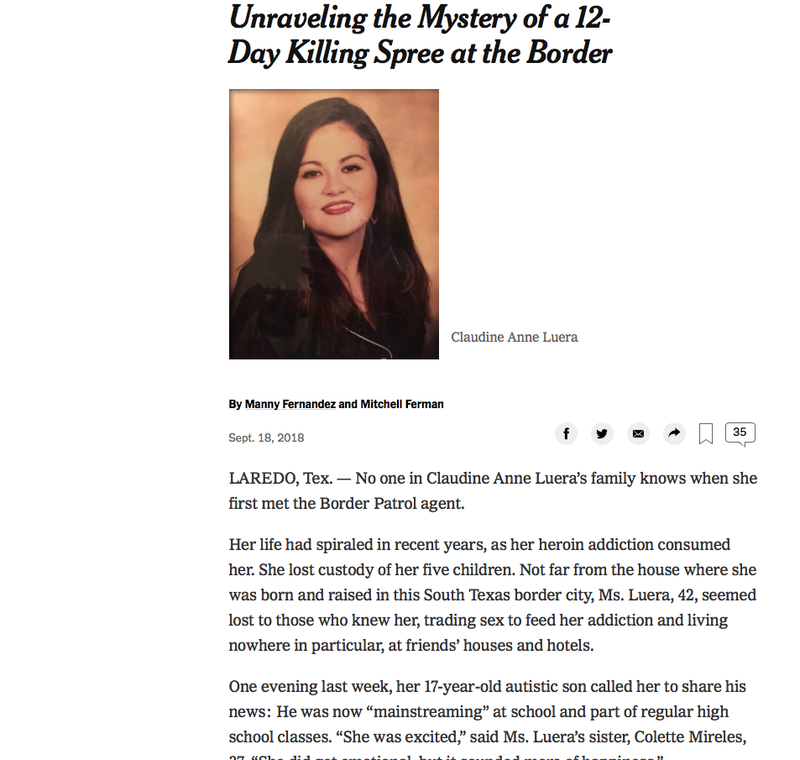 Claudine Anne Luera got addicted to drugs and lived dangerously on the streets of this forsaken city. Her loved ones will now have to live with the added insult of her life being take away so tragically. 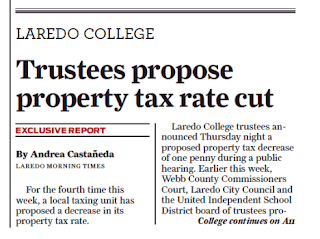 Local taxing entities have been following each other's lead in lowering their tax rates. That may be because it's an election year (midterms) and because property valuations have skyrocketed in the last couple of cycles, leaving taxpayers stunned at their new property tax amounts. Lowering the tax rate is admirable; it counters the rising property valuations. BUT them lowering their rates to where we get a whole $3-per-year savings, per taxing entity, is sad. They can brag that they are helping us out, but the end result is pitiful. 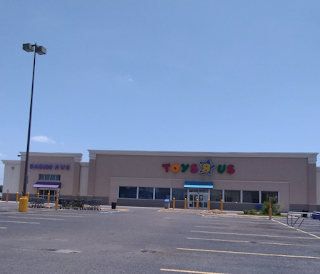 A side-by-side comparison of what the Santa Maria terminus, at the River Drive Mall, looked like (on the left) and how it looks now with the Outlet Shoppes in place. Same thoroughfare, different surroundings. 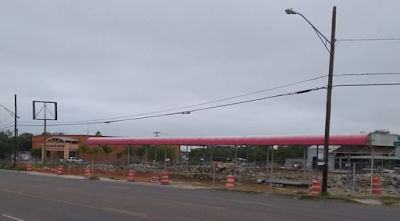 Demolition of the old River Drive Mall started 3 years ago. 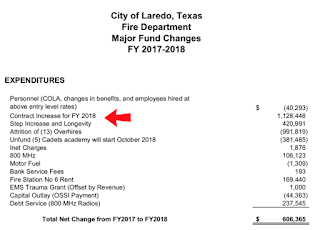 City council added a supplemental agenda item for tomorrow's meeting, where officials will have the opportunity to approve the contract for the firefighters, ostensibly. Because of the item, firefighters may see salary increases for the next four years, among other things. The fire department is composed of 14 stations. 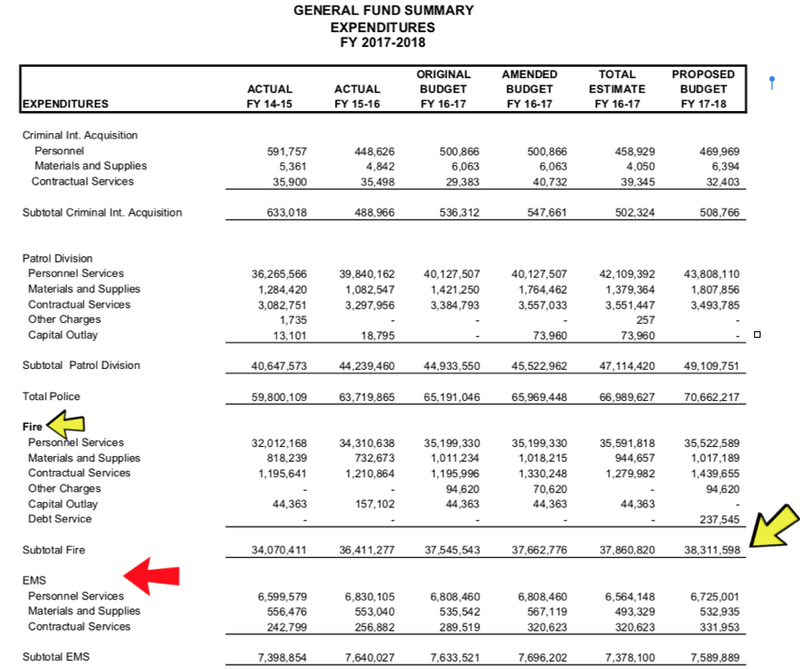 For this fiscal year, that is on its tail end, firemen got $1.5 million in pay/benefit increases. At tomorrow's meeting, they stand to get more for the coming year. Here's a breakdown of the expenditures the city needs to cover for the fire department. It includes more than $1.1 million to cover contract obligations. Tax money that has gone towards the fire department has increased year after year. 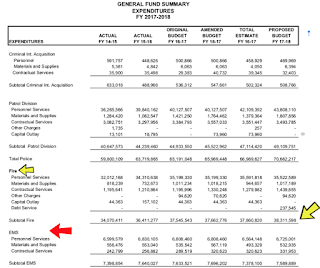 The city listed, in their budget, the ambulance service fees that were collected for one year: $4,671,980. That comes from billing residents every time EMS units and fire units respond to an emergency. 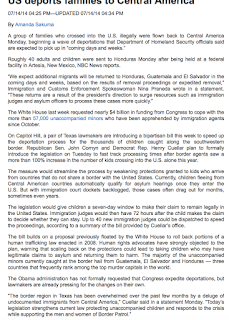 We the public get a bill. Right now city staff, Mayor Pete Saenz and union president David Gonzalez are all presenting different figures and reasons for delaying or approving the salary increases. I don't know that CONSTANT salary increases for police and firefighters are sustainable over the long run. The appraisal district can only justify hiking property valuations for so long, enabling the city to collect more tax revenue. Transfers from bridge toll fee collections can only do so much, and is not necessarily there to benefit those who can unionize locally. 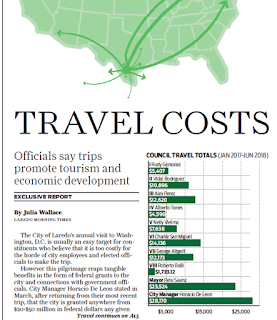 And if the city is $1 billion in debt, we should really take our time to approve any potential budgetary constraints. 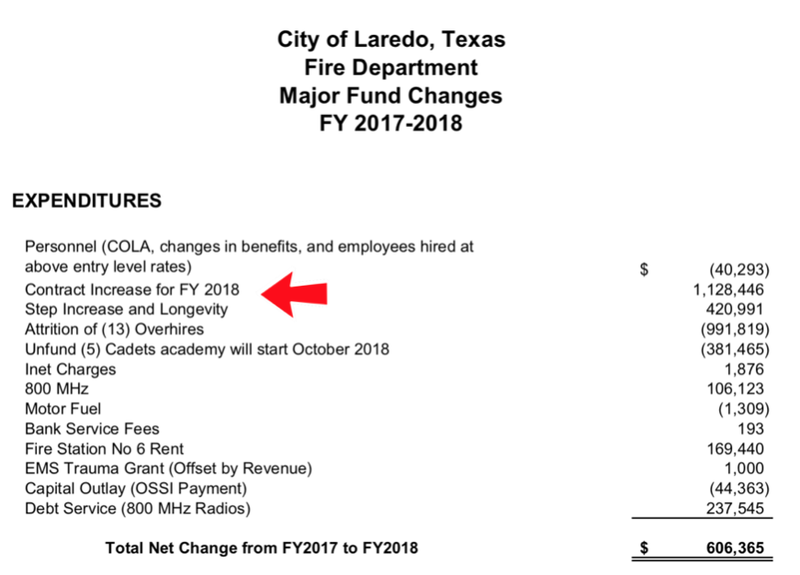 And because council members accept donations from the firefighters union, the thought of rushing through a contract with benefits that so few in Laredo are able to take advantage of, but comes at the expense of the greater community, then city council should delay the decision as long as it takes. 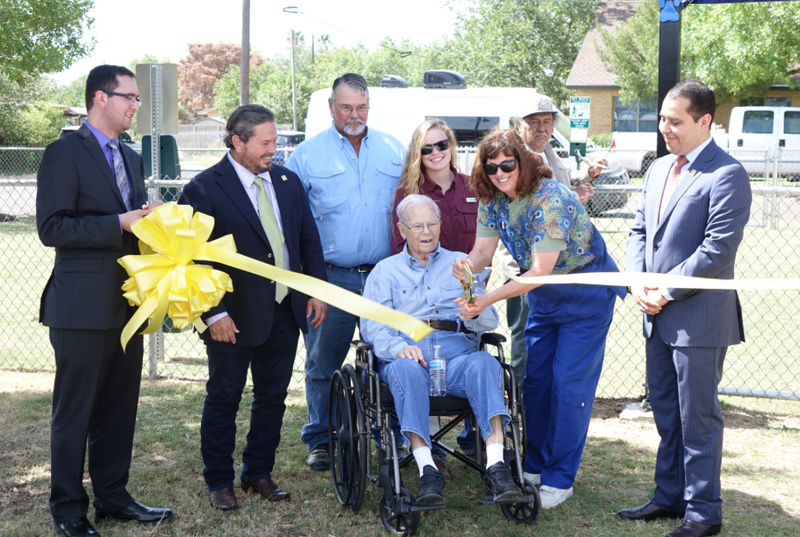 A green space, with fencing, was christened by the city yesterday to provide an outdoor playground for our four-legged friends. A happy occasion, maybe not for the Parks & Leisure employee in the background. He's dropping a heavy dose of the stink eye on everyone. 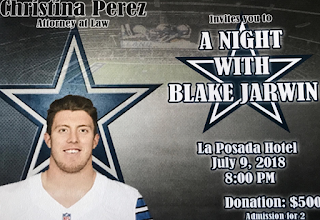 Councilmember Alex Perez -- FBI target subject and person who gets prickly when you don't want to shake his hand -- welcomed Dallas Cowboy player Blake Jarwin to Laredo recently. Jarwin MAY or may not have family ties to the Perez's. Here you see Jarwin signing autographs for the peoples. I had noticed a lot of activity at Slaughter Park on July 8, 2018, but didn't know what all the hubbub was about. 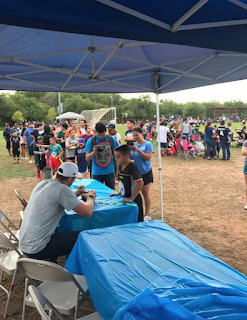 Apparently Blake Jarwin made an appearance at more than one city park in south Laredo, to the delight of faithful Cowboys fans. 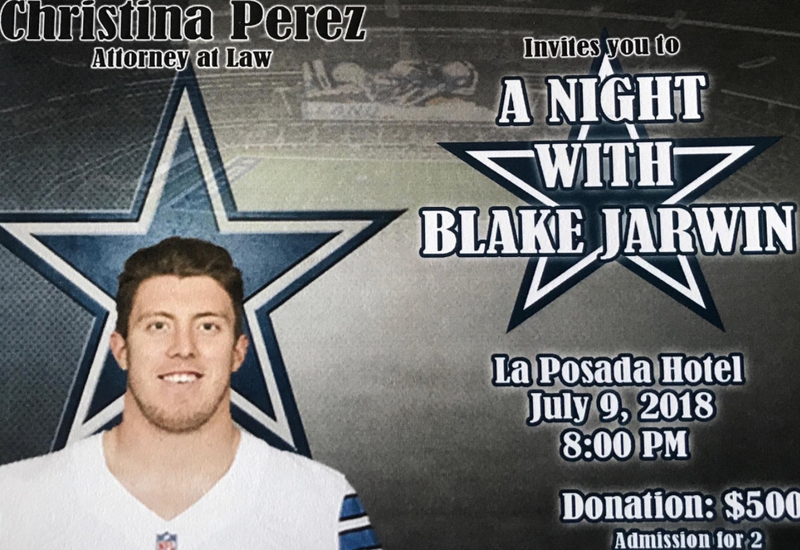 On Monday, the Dallas baller was the featured guest at a pricey fundraiser, all to benefit Cristina Perez, candidate for City Council District 3 and current wife of sitting District 3 Councilman Alex Perez. It must be nice to have a wide range of city resources at your disposal to advance the political campaign of your wife. 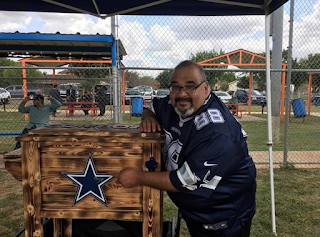 I don't know how civic-minded the park attendees are to remember the Perez's gesture and go vote in November; But these little publicity stunts should be examined with a closer look. That's highly unlikely, however, since the ethics commission has members dropping like flies. 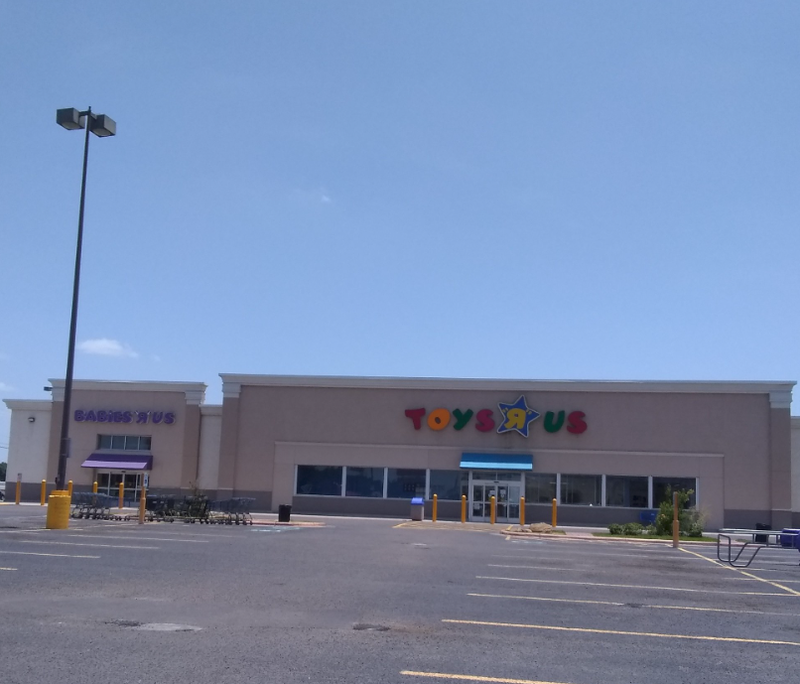 I took this shot of the Toys R Us on Friday, June 29, 2018, when the franchise officially went out of business and closed all of its stores nationwide. You can tell it's the Laredo store by the potholes in the parking lot. 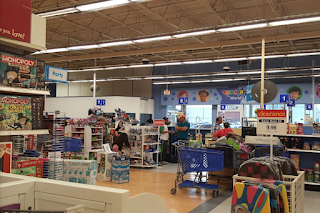 This store held some sentimental value for my wife and I since it's where we used to take our son shopping for Thomas the Tank Engine characters, or some odd type of Lego sets. This interior photo I found online. I recall many a time we had to stand in line to wait for the next available clerk to ring us up. It's a peculiar thing to see longstanding landmarks come and go. 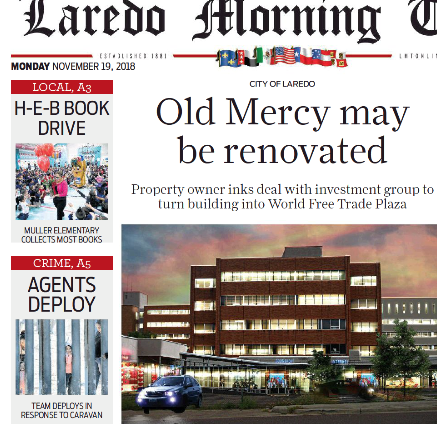 As much as they were part of Laredo's progress, their exit is sometimes a mark of decline for our fair city. 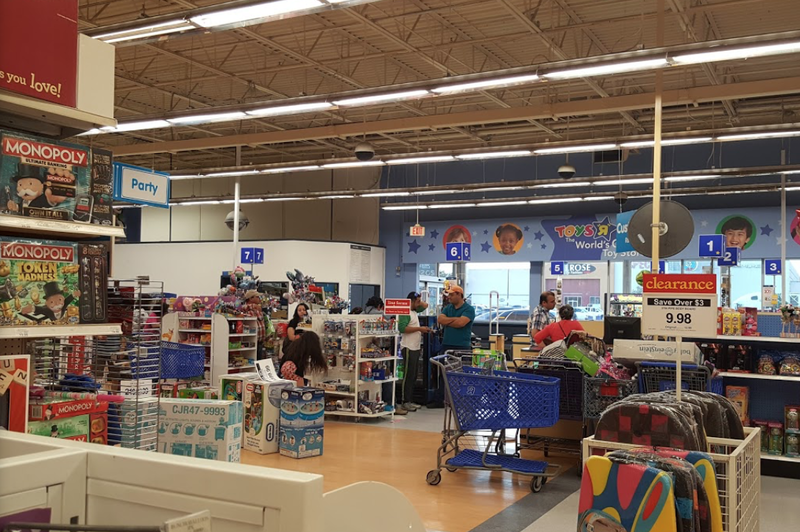 Usually the upside of retail spaces or service outlets that go belly up is that a new venture is bound to come in to replace it. 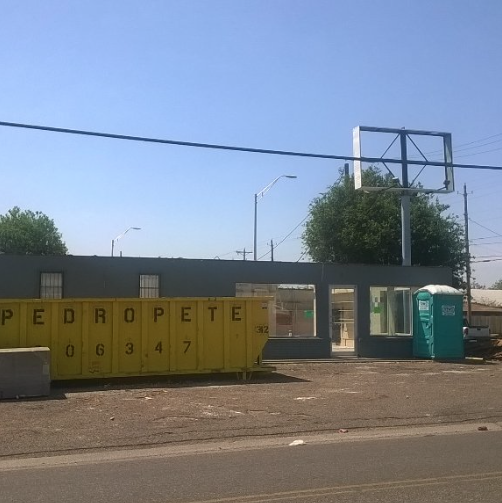 Good or bad, it precludes the possibility of urban blight setting in. Typical tweet from a typical politician after another school shooting, this time in Texas. 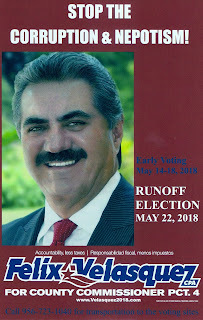 At least one runoff candidate has dropped by the Keyrose compound to remind us of the looming election, later this month. His message straight and up front: Stop the corruption and nepotism. Exclamation point. Over the weekend, approximately 900 voters approved the LISD bond measure, which will allow improvements to existing schools and enable the district to build a new Cigarroa Middle School campus. Ya veremos. And the field is getting crowded for the spots that will open up at city hall this fall. 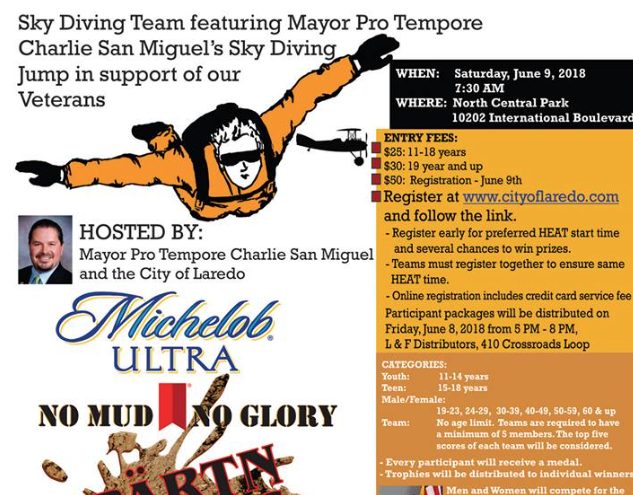 People are already starting to file their paperwork for-to get a chance at Charlie San Miguel's, and Alex Perez's (a La Sanbe favorite) seat. Let's not forget that a certain FB celebrity is vying for the mayor's office. How do you say 'moment of Zen' in Spanish? I did not vote in Tuesday's primary election. I was very clear about it on social media. My absence from the polls was inevitable. It was only this month that I followed through with my self-imposed ban from voting. 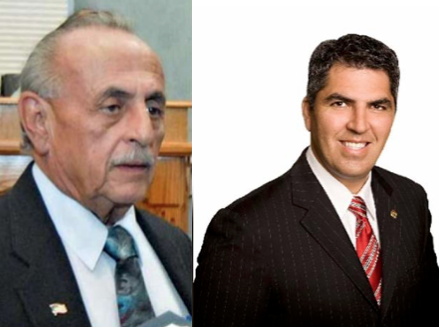 It comes from years of disillusionment with Laredo's political figures. It comes from shared stories of acts of pettiness on the part of council persons and commissioners. It comes from the defensive tone that pols take when they're challenged. 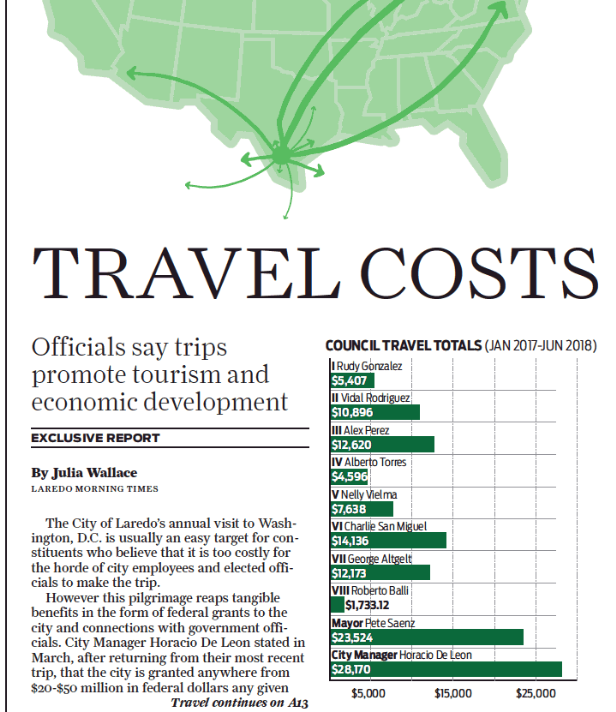 And it comes from countless reports of undeserving city and county leaders who do things that are less than honorable. When you look at the photo above, you notice that there has been a turnover of elected officials. We can thank term limits for that, perhaps. 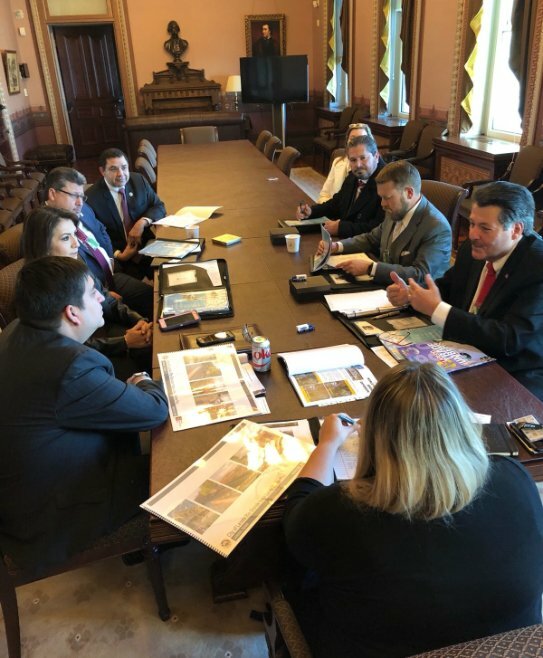 Nelly Vielma, George Altgelt and Pete Saenz are seen meeting with federals staffers in Washington, D.C. The three have settled in nicely to their first term as city representatives. In the background, to the right, you see Charlie San Miguel and a lady who is strategically positioned behind him. Through a trusted source, I found out that the lady is his wife. 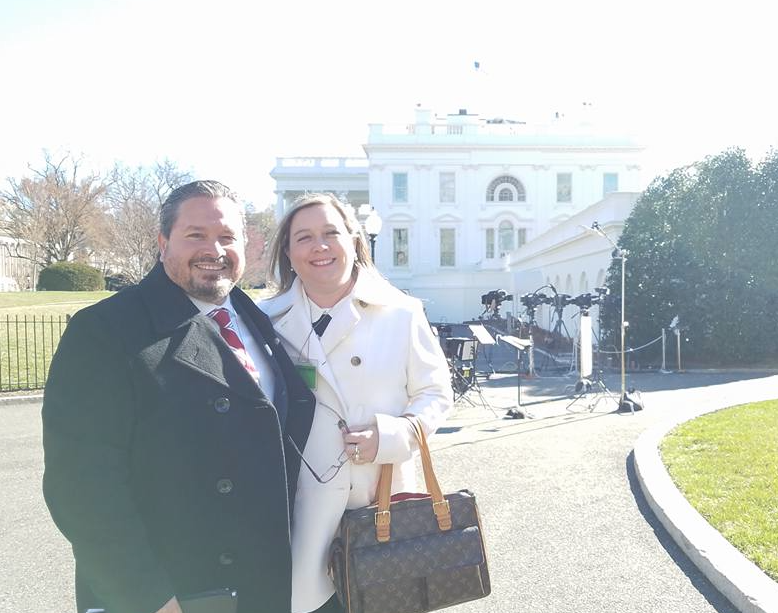 You have a family member sitting in on official city business inside the White House. 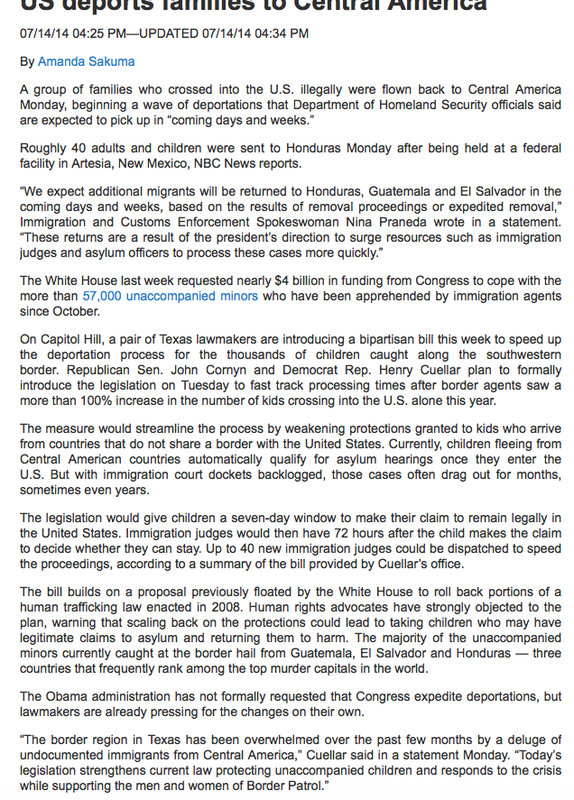 You have a spouse who is taking advantage of fancy lodging in our nation's capital, courtesy of the Laredo taxpayer. I find this utterly unacceptable. 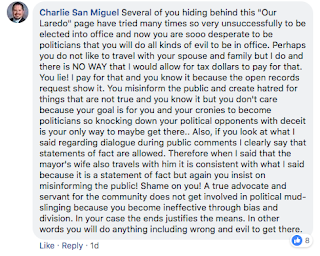 What's worse is that Vielma, Altgelt and Saenz tacitly approve of San Miguel's actions while away from Laredo. 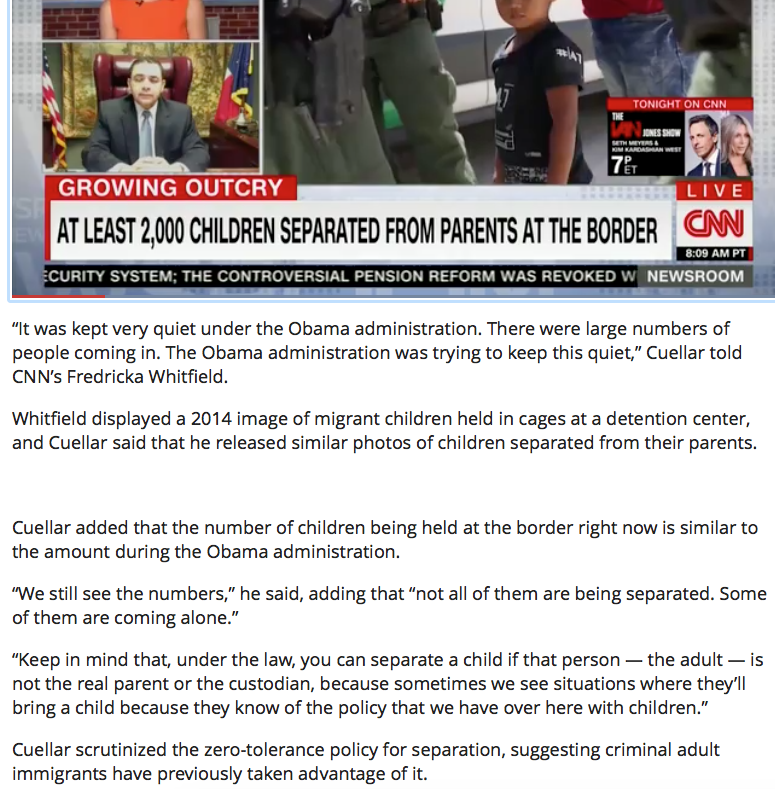 We have politicians not looking out for our best interests and others looking the other way. It's a futile battle when the electorate has to go up against the so-called political machines, the uninformed citizenry that blindly casts votes and the vote harvesters who wrangle people's support in return for some type of gain. 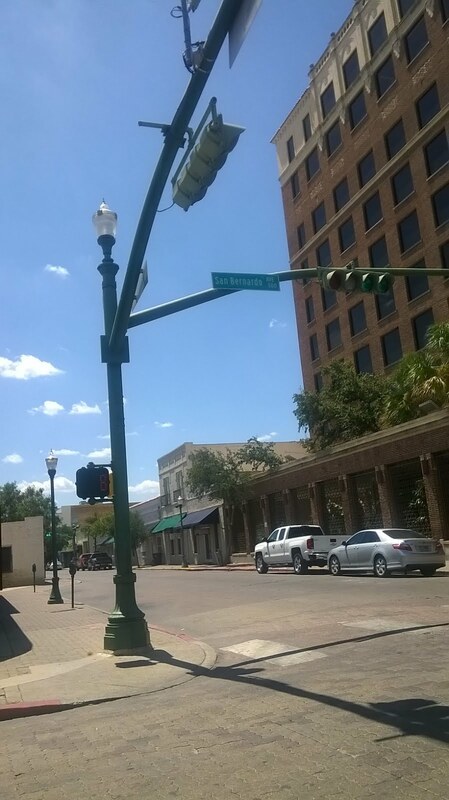 Add to all of that the willingness of those who seem honest to go along with the worst of Laredo and Webb Co. 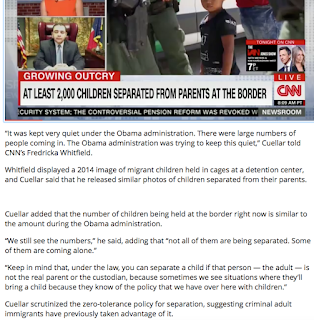 If the well-meaning officials are there to prop up the bad ones, then what effect can my measly vote actually have.